Regionally inspired Gourmet Seasoning Blends packaged in a 4 oz rust resistant tin. Each is a blend of all natural herbs and spices expertly crafted to represent two beautiful urban cities. There are simple to follow instructions on how to use them on the bottom of each tin. 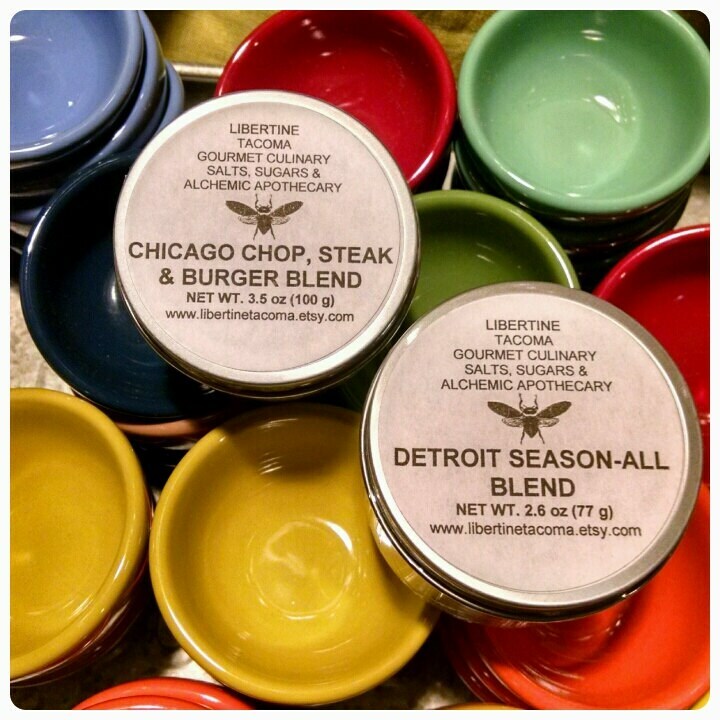 "Chicago Chop, Steak & Burger Seasoning" Ingredients: Himalayan Pink Salt, Demerara Raw Cane Sugar, Garlic, Onion, Tellicherry Black Pepper, Natural Hickory Smoke Flavor, Citric Acid. "Detroit Season-All" Ingredients: Himalayan Pink Salt, Spanish Sweet Paprika, Tellicherry Black pepper, Garlic, Onion, Celery Seed, Italian Basil, Parsley, Greek Oregano, French Thyme, Lemon Peel Powder, Tomato Powder. These blends are completely vegan and gluten free. Liberte Du Monde Gourmet Seasoning Blends are all natural, most are vegan and additive free. No anti-caking agents are used as they can potentially be hazardous. If your salts or blends become “clumpy” just keep the lid tight and shake them around before using. Please store them in a cool, dry place out of direct light and heat.